Tuesday May 28th 1878 I sewed all day. I finished Mothers dress before supper and intended to go to Wins to stay all night but it rained so I could not. I cut out a couple of calico dresses for May in the evening. Wednesday May 29th 1878 It was a rainy gloomy morning so I saw down and made Mays dresses. In the afternoon I did the washing and put the clothes to soak. I was tired and didn't do much of any thing in the evening. 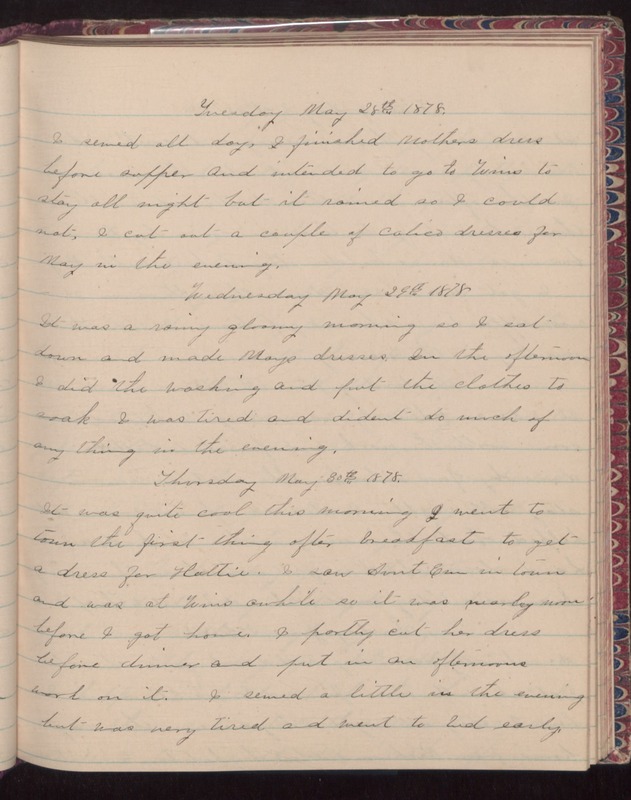 Thursday May 30th 1878 It was quite cool this morning. I went to town the first thing after breakfast to get a dress for Hattie. I saw Aunt Em in town and was at Wins awhile so it was nearly noon before I got home. I partly cut her dress before dinner and put in an afternoons work on it. I sewed a little in the evening but was very tired and went to bed early.